Angle has an intuitive graphical user interface. It consists of six parts – the ribbon at the top of the window and five principal data groups arranged as frames in the main Angle window, as shown in the following figure. Ribbon – replaces the classic application’s main menu. 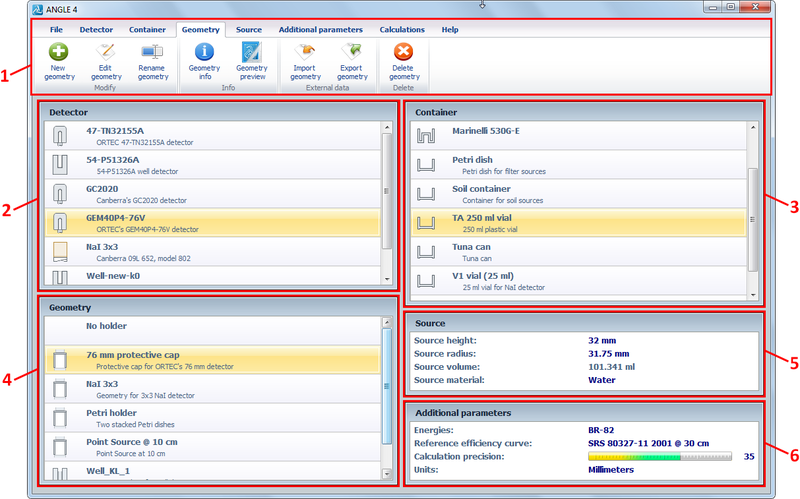 This makes usage of Angle faster and easier, while maintaining the functionality of the main menu. The ribbon consists of eight tabs: File, Detector, Container, Geometry, Source, Additional parameters, Calculations and Help. Detector frame – contains an alphabetically sorted list of all detectors defined in Angle. Each detector is labelled with its name and description. Detector icons in the left-hand part of the list display one of the eight possible detector types. Container frame – contains an alphabetically sorted list of all containers defined in Angle. Each container is shown with its name and description. Container icons in the left-hand part of the list show one of the two possible container types. The “No container” option is at the top of the list. Geometry frame – contains an alphabetically sorted list of all geometries defined in Angle. “Geometry” here means the geometrical positioning of the source vs. the detector, including source support (the “holder”). Each geometry is shown with its name and description. Icons in the left-hand part of the list represent one of three possible geometry types (for well detector, for Marinelli geometry or for other detector/geometry types). The “No holder” option is at the top of the list. Source frame – contains information about the radiation source used for calculations (height, radius and material). Additional parameters frame – contains the remaining calculation parameters: the set of energies of interest, the reference efficiency curve, the calculation precision and preferred units of length (millimeters, centimeters or inches). If you keep the mouse pointer over any button on a ribbon for a short time, the hint for that button will appear with a brief description of the functionality of the button.